We believe we can offer our customers a wide range of prototyping services to help improve security intelligence in the world. These services help address homeland security and large-scale civil information systems that enhance city, county and state government services. We are able to take concept ideas off of napkins and transform them quickly for evaluation for the clients. "Spike"- This concept was for non lethal ordinance issues for federal and local law enforcement agencies. "RCSS"- Partnered with Northrop Grumman Corporation a leading global security company clearing land mind. "Gladiator"- Concept robot that was prototyped for the United States Army to assist with surveillance. Spike is designed as an emergency or terrorist response vehicle capable of hostage mediation, explosive ordinance removal, and mine sweeping. Spike can climb stairs, travel through doorways, and traverse rugged, off-road terrain, while carrying up to 300 lbs of equipment. Specifications are: 375 lbs, 8 hp diesel engine, hydrostatic drive, rubber tracks, up to 20 mph. A magazine article about Spike can be read at LJWorld.com. The RCSS is designed as an emergency or terrorist response vehicle capable of hostage mediation, explosive ordinance removal, and mine sweeping. This picture shows the RCSS configured with mine sweeping attachments. Four prototypes were manufactured for the Army. 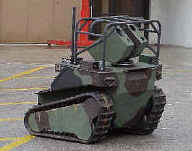 The RT-20 is an unmanned, remote controlled vehicles designed to perform duties too dangerous or tedious for personnel. The 1.5 ton crawler can accommodate a variety of implements and is available in tethered, remote, or GPS command and control options. Currently in use for ordinance removal, mine sweeping, and agricultural applications, the RT-20 can traverse sand, mud, snow and steep terrain. The Gladiator is a 1,300 lb. robotic rubber tracked platform made of ballistic steel, measuring 40"x35"x50". It has an 8 horsepower, 4 stroke air cooled diesel engine. It is remote controlled, with video, thermal imaging and motion sensor for surveillance. The GLADIATOR project was started by the U.S. Marines to promote the use of UGV vehicles by field soldiers. Two prototype Gladiator vehicles were built in December 2000 through the Joint Projects Office in Redstone Arsenal in Huntsville, Alabama.